Hi Everyone, I'm new to this group & I'm off to see Patricia Routledge this evening!!!!!! My name is Tom, I'am a big fan of Keeping up Appearances, I'm glad I have found this club and being able to become a part of it. I'am off to see Miss Routledge this afternoon at the Theatre Severn in my home town of Shrewsbury, Shropshire!!! It's always been a great wish to see her in-person, for her coming here is a real treat indeed!!! I have two front row tickets for Myself & My Mum who's a big fan, we have a 10 x 8 photograph at the ready, with the great hope of being able to meet her today after the show. However, at the Theatre there is two chances of her greeting the fans, as inside they have a table/chair with a backdrop where people wait after the show for the performer to greet. While at the same time there is the stage door at the front of the building. I'm just wondering where to wait and for any advice from fellow members on how to meet her and how long to wait for her to appear?? I would greatly appreciate your time believe me. My Mum already has her autograph, as she wrote to her back in 2007, but just to be able to meet her, having a photograph and autograph would be just.... awe!!! If not, then I shall write to her this coming week. I also plan of giving her a box of chocolates too!!!! Hi Tom, welcome to the forum! Hope you have a lovely time, how exciting, we will look forward to seeing your photos! Thank you for your warm welcome!! I'm just about to create a new thread on here of my talk this afternoon in Shrewsbury. Hi, Tom! I read your thread and am thrilled that you had a wonderful time. Meeting Ms. Routledge is definitely on my "bouquet list." Hello welcome the forum, wow what an amazing experience! I hope it was everything you could have imagined and more! Welcome inside the Bucket residence Tom! Thank you everyone, such a lovely and warm welcome indeed!!! I feel you all would be much welcome to my candle light supper!!! I also have some news for everyone, I tweeted Edward Seckerson who performed with Miss Routledge to ask if she had received my card & chocolates. I have screen capped the responses, which have been brilliant, fingers crossed now I hear back direct from her!!!! Here's my first contact with Mr Seckerson, he even added me & favored the comment alongside the Theatre Severn!!! Here's the message I received last night Confirming Miss Routledge received my card & chocolates Look like I could be in her good books too!!! Hello, a pleasure of meeting you. That's wonderful, you got to see Patricia Routledge. 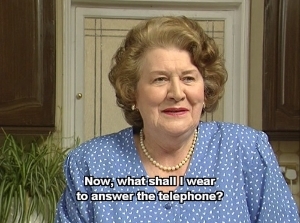 Subject: Re: Hi Everyone, I'm new to this group & I'm off to see Patricia Routledge this evening!!!!! !